First round of Back to School clothes for Monster High -- now in my shop on etsy - Yay! Have you made your own clothes, your own custom doll(s) after spending some time here? Do you have photos? I would love to share whatever you have been doing out there in the custom lane. 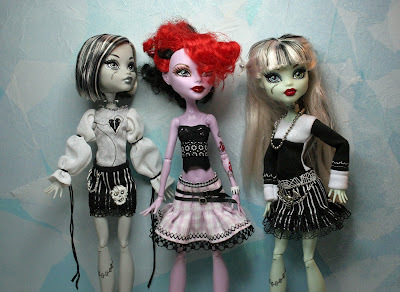 They do not have to be Monster High dolls, or Monster High clothing. I hear from other fashion doll fans and would love to see what you have done too! Please send your photos and descriptions to: pbvanchance@hotmail.com and I will post your good works here. Wishing you all the best as we head into the last of summer and the beginning of fall. Love the new cloths. You are so talented in that respect. Also, I haven't forgotten the great tutorials. I have not had enough time yet to get busy. But, I am going to get back to it once my new computer arrives and is set up. I can't process any art in a timely or efficient time frame until that happens. Thanks as always for sharing. I am excited for you about getting that new computer. Can't wait to see what you do next! Great blog post -- I read it :) I enjoy your writing style. Good advice in there too. And Thank You - Frankie loved modeling that set. U did it! I knew u could! Remember I asked about more posts! ?